Finally, a cool enough morning to enjoy my coffee outside while Sophie slid and slid and slid, and Owen and James watched leaves flutter in the breeze (a pastime I vividly remember Sophie enjoying, too). 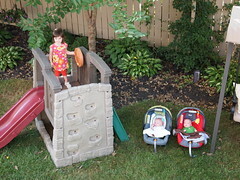 This entry was written by kara, posted on September 13, 2010 at 3:09 pm, filed under Uncategorized and tagged backyard, coffee, James, Owen, Sophie. Bookmark the permalink. Follow any comments here with the RSS feed for this post. Post a comment or leave a trackback: Trackback URL.